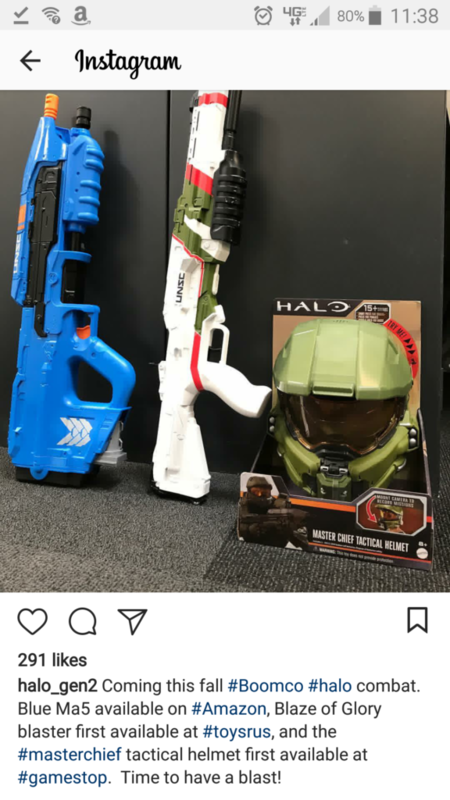 Thanks to @Halo_gen2 on Instagram, we have new info on this holiday season for the Boomco line. The Blaze of Glory, a pump action, clip fed blaster, will be out in November for $34.99 at Toysrus, the starting home for most Halo blasters. In addition, a new blue version of the MA5 assault rifle will be exclusive to Amazon. As you may recall, Amazon also carried the blue version of the Rapid Madness when it first came out. Along with the blasters, a new helmet/camera mount will be available at Gamestop, for those wanting to pretend they’re actually Master Chief. Previously, Gamestop carried the light-up Plasma Sword. No word yet on camera compatibility, although some kind of Gopro mount would make sense. This has me excited, as Boomco fans like myself have been wanting a pump-action springer since the line first arrived. My Flipbow has worked wonderfully for HvZ games, but the Blaze of Glory would easily replace it in my loadout. This entry was posted in Dart Blasters, News/Updates and tagged Blaze of Glory, boomco, Halo, mattel on August 31, 2017 by BuffdaddyNerf. Is that a full helmet???? :O Gosh, I’ve been waiting to get a MA5, and now I’m going to be so torn between it or the shotty……. Will the shotgun still be single-fire, or more than one dart? That is a full helmet. OK… originally I thought it was half, then I thought it was whole…now I know it is half. In response to the shotgun, do you mean the Blaze of Glory, or the Blue Ma5. I am quite sure the BoG is not a shotgun. I don’t know about the Ma5, however. Yeah, sadly. I wish it was the whole helmet, I’d buy it in a heartbeat!! It is possible. I have done it myself, but with limited success on nerf clip system blasters. You could probably do it on a strongarm/spectre/longarm/surgefire by removing the dart post. Single shot blasters can take 2 stefans at once in their barrel. I also believe that brass breaches can make a type of “shotgun” clip system blaster. I think I saw it before on Outback Nerf’s blog. True, on Nerf. I mean specifically with a boomco mag, though. It’s a stretch, but I wonder if somehow cutting into the mag would let the air compression go to two holes instead of one. Has anyone attempted a Boom Co. Stefan? If you removed mag dart posts, and used these theoretical “Boomco stefans” then you may get a shotgun solution. Problem is the balance of Boom Co. darts is meant for accuracy stock.